"In violin making, it is about bringing craft and art together." 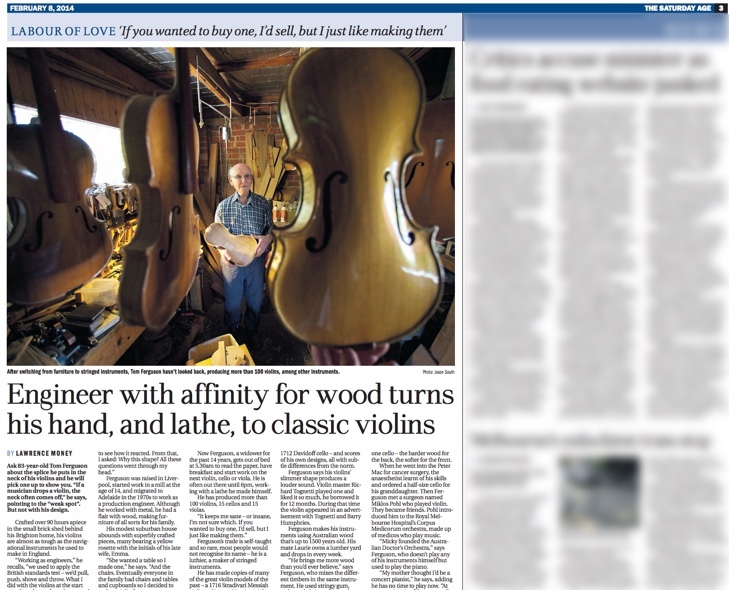 "Violin making, is about bringing craft and art together." I believe that curves and lines work together to determine the outcome of the final sound. Ferguson’s trade is self-taught and so rare, most people would not recognise its name – he is a luthier, a maker of stringed instruments. He has made copies of many of the great violin models of the past – a 1716 Stradivari Messiah violin, a Giovanni Battista viola, a 1712 Davidoff cello – and scores of his own designs, all with subtle differences from the norm. Ferguson says his violins’ slimmer shape produces a louder sound. Violin master Richard Tognetti played one and liked it so much, he borrowed it for 12 months. During that time the violin appeared in an advertisement with Tognetti and Barry Humphries. Ferguson makes his instruments using Australian wood that’s up to 1500 years old.